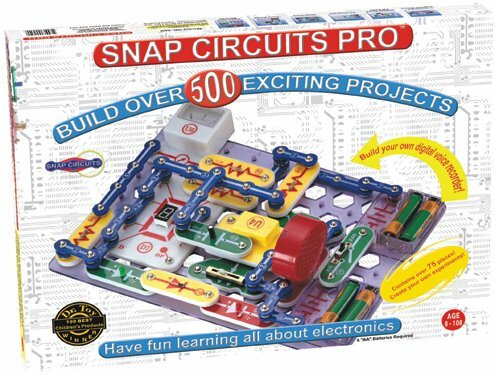 Elenco’s new Snap Circuits makes learning electronics easy and fun! Just follow the colorful pictures in our manual and build exciting projects, such as FM radios, digital voice recorders, AM radios, burglar alarms, doorbells, and much more! You can even play electronic games with your friends. All parts are mounted on plastic modules and snap together with ease. Enjoy hours of educational fun while learning about electronics. No tools required. Ages 8-108. Requires “AA” batteries. SC-500S DELUXE PRO Model contains over 75 parts to build over 500 experiments using resistors, capacitors, LEDs, switches, speakers, transistors, integrated circuits and more! Includes voice recording IC, FM radio module, analog meter, transformer, relay and 7-segment display. This is the DELUXE version, same as SC-500 plus 20 bonus computer interfaced experiments.